Happy Thanksgiving!!! Well, it’s one of those super busy days for us cooking fools. Luckily, this year I avoided the duty of cooking Thanksgiving dinner. We are enjoying it with my family in North Carolina. This means my step-mother has the job of cooking for 10 or more. I suspect I will be in the kitchen offering to help, but have a feeling I’ll be turned away. However, I’ve done a few of these over the years and know the panic that sets in the morning before the meal. You start to think, “What else am I going to serve other than turkey and that 99 cent can of cranberries?” To ease this common culinary anxiety, I’m giving you a pair of my old standards for the holiday — Deep Dish Pecan Pie and Chorizo Cornbread Stuffing. These are tried and true friends who never let me down. So if you are in a pinch (or even if you aren’t), steal them, use them, and fill up your family and friends. Neither is particularly time consuming to make. There is lots of oven time for both, but not time you are actually standing over things. They also both travel extremely well. So if you are heading over the river and through the woods to — someone else’s — house, they make good additions to the car trip. Either way, I hope you are having the happiest of days with the people you care about. We will be. Happy Thanksgiving from the wife and me! 1. Bake the corn muffins per directions on the box. Let cool to room temperature. 2. Remove the chorizo from its casing. 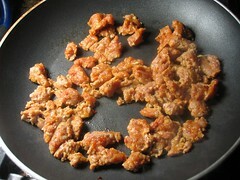 In a large skillet or frying pan over medium high heat, add the loose sausage. 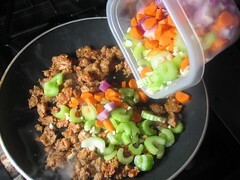 Once the sausage begins to take on a slight bit of color, add all the vegetables. After about 2 minutes, turn down the heat to medium and cook, stirring regularly, until the onion begins to take on a slight brown, 6-8 min. 4. 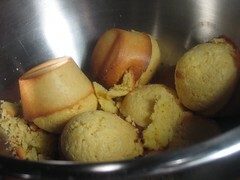 In a large bowl, add the corn muffins and break them up into smaller pieces. 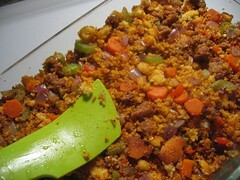 Add the vegetables and sausage mix. 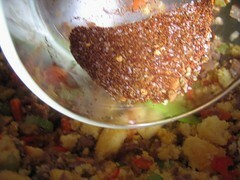 Add the spice mix. Combine until all ingredients are thoroughly distributed. 5. 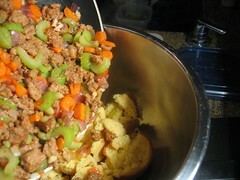 Turn out your cornbread and sausage mixture into an 11 x 8 or similar oven safe baking dish. 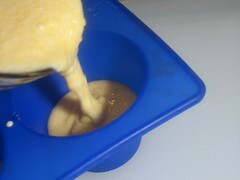 Distribute the mixture evenly throughout and lightly press flat. 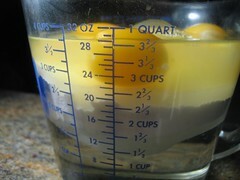 Pour the chicken broth over the mixture, making sure to evenly distribute it. 6. Place in oven and bake for 35-45 min. The result should be moist on the interior while having a slightly crisp top. Let cool for about 10 min. Serve warm. Enjoy! 1. 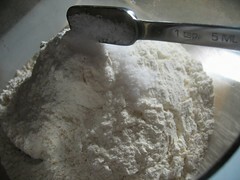 Using a food processor, add the flour, salt and sugar. Pulse for 2 seconds so the ingredients are integrated. 2. 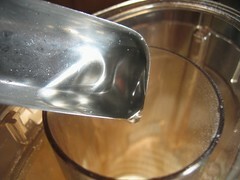 Place the butter and shortening in the food processor. Pulse for 2 seconds 5- 10 times. 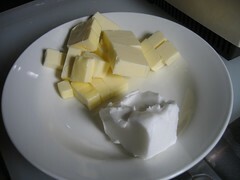 The butter and shortening should not be in large chunks. 3. Add the vinegar and pulse again briefly. Now it’s time to add the water. Add it one tablespoon at a time followed by a pulse. 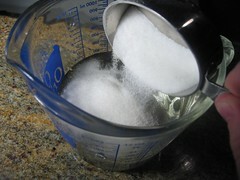 By the fourth tablespoon, it should begin to look like it is sticking. Add the other two as you see fit. You want the minimum amount of water so that it is easy to handle, but not so much that your dough is chewy. I would not hesitate to add more if you are in a particularly dry place. 4. Place the dough in a plastic bag or wrap in plastic wrap. Let it rest in the refrigerator for 20 min. 1. 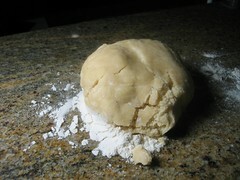 Remove your dough from the refrigerator and let rest on the counter for 5 minutes, longer if it is hard. 2. Now, on a piece of parchment paper or on a well -loured counter, place your dough. Flour your rolling pin and the top of the dough and gently roll out the dough. It’s usually best to roll in one direction and turn the dough. Once it is about 14 or so inches in diameter you can stop. 3. Using a 10-inch pie dish, gently fold the dough in half and lay it over the pie dish. 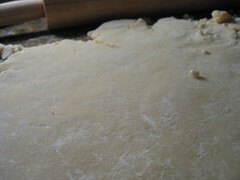 Press the dough into the corners. 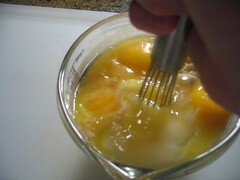 Crimp the sides lightly with a fork or using your thumb and finger. Place in the refrigerator until ready. 2. 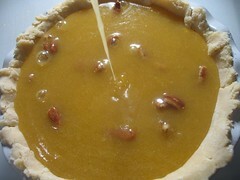 In a bowl or large measuring cup, add all the ingredients for the filling except the pecans. Whisk until everything is fully integrated. 3. Remove the pie shell from the refrigerator. 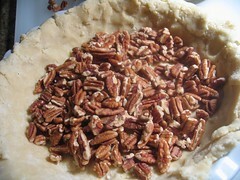 Layer the pecans across the bottom of the pie crust. 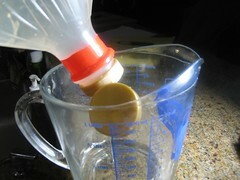 Pour in the mixture and allow the pecans to float to the surface. 3. Place in oven and bake for 80-90 min. 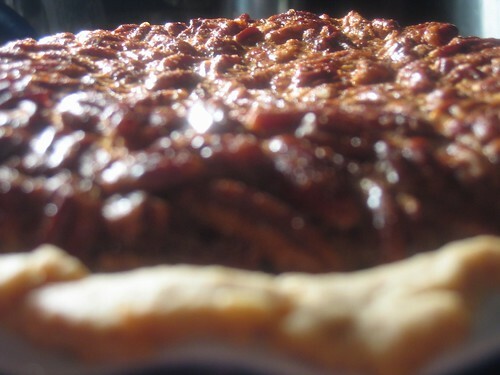 By the end, the surface of the pie should bow upwards from the center like a bubble. Remove from the oven. Let cool for at least 30 min. If you serve too soon, the interior will be too loose (and molten hot). Once firm, serve by itself or with ice cream. Enjoy! 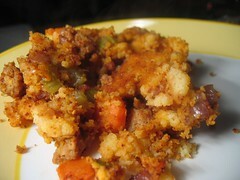 I really like the look of your cornbread stuffing (although I’d use my own cornmuffins rather than a muffin mix – we’d probably have chili and cornbread the night before and use leftover cornbread for the stuffing). 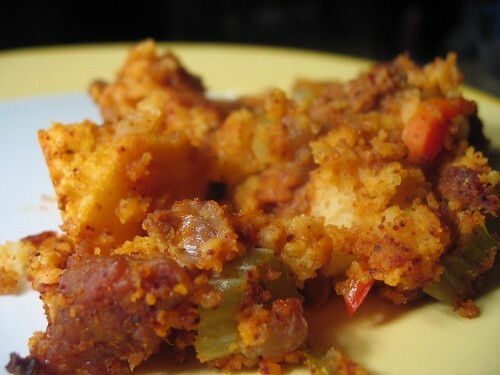 We usually put a bit of ham in our cornbread stuffing but chorizo would be an excellent addition. 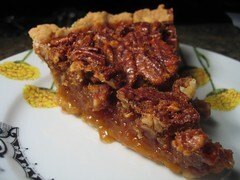 And your pecan pie looks fantastic! No icecream for me thanks, creme fraiche or plain yoghurt please! Thanksgiving in North Carolina sounds wonderful. Love the Carolinas! I’ve got to dig up my father’s pie recipes; you’ve inspired me. We had Thanksgiving in North Carolina too, but it’s my home base so my sister and I played host to nine in total. Wasn’t the weather great this weekend? Your cornbread stuffing looks fantastic, and I think I will try it out on Wednesday, when we have the friends over for a Thanksgiving hangover dinner. Belated Happy Thanksgiving to all of you! We got back late Saturday and it was a great time. For those of you not in that area of the world, you missed some stunning weather in the Carolinas. Luckily, it has continued here in DC. As for the recipe, let me know how it goes. I make my own and having people critique the recipe so I can improve it or my explanation is great. The corn muffins are of course swappable. I use Jiffy because they are easy-peasy and when you are in a bit of a frenzy you cut corners. They are also sweet corn bread which can be quite a controversy. I hope you had a great holiday! Now its time for me to start planning Christmas dinner. I’ll keep you in the loop with what I plan.